Doing science is hard, and understanding other people's science is almost as bad. But chuck in a few cat memes and it becomes fun ! Right... ? Well, I think so, anyway. Here's a collection of the more popular popular science posts I've written. Not exactly a science post, but more an art/rant/philosophy post where I torture data until it looks pretty. Not exactly a popular post either, but it's going in this section because I'm such a rebel. 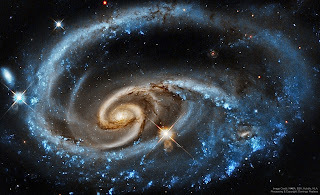 Extracted, expanded and elaborated from part four of my lecture course, I look at the popular claims that satellite galaxies tend to be distributed in narrow planes around their host galaxies. I look at why this would or would not contradict the predications of the standard model and why all but one such claims are on flimsy ground indeed. This is one for the dedicated enthusiast : transcripts of a four-part introductory course on galaxy evolution, given at Charles University in Prague. The particular focus is on radio astronomy and the dark matter content of galaxies. Each lecture was 90 minutes long. Part one looks at what we're really confident we think we know about galaxies, giving a contextual look at galaxy sizes, shapes, masses and other basic properties. Part two looks at how we go about measuring galaxies, with practical instructions on optical photometry and HI radio spectroscopy (with equations). 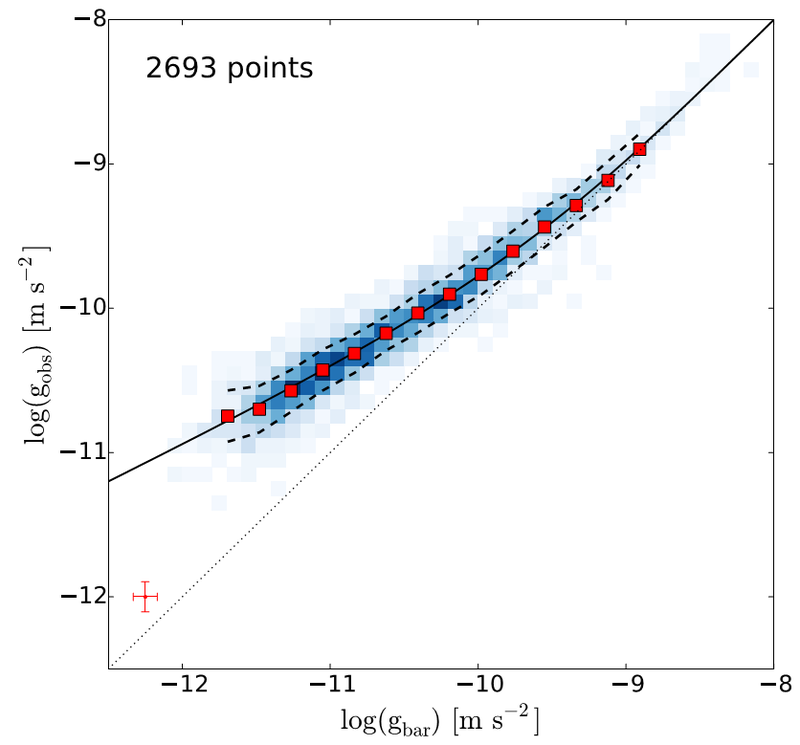 Part three looks at the basics of galaxy evolution theory, but diverges to a bit of statistical philosophy to consider why we interpret the observations in the way we do. Part four goes into more detail on theory but also looks at current controversies in the field. I don't normally venture to comment on theory, but sheer irritation at the overstated importance of this "discovery" compelled me to. 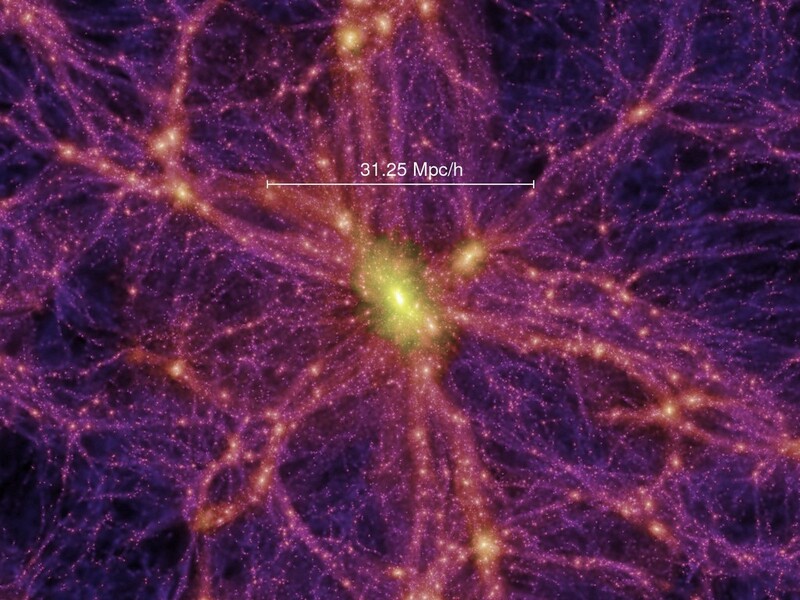 The claim is that observations have uncovered a new law of nature, where the acceleration of ordinary matter is tightly correlated with the dark matter. An undercurrent of disproving the standard model pervades this research, so I look at how much this finding is really incompatible with the dark matter paradigm and whether any interesting results may yet emerge from it. Follow-up to the "moaaarrrr galaxies" post. Just how massive are these newly-discovered faint smudges ? Are they super inflated dwarfs or ghostly giants ? I look at the raging controversy around this area, what it could mean for theories of galaxy evolution and why these aesthetically dull objects are actually incredibly interesting. Expect even more posts as the evidence changes faster than Donald Trump's policies. Any fool can go on about the majesty of nature, its irresistible power and the unfathomable depths of that vast abyss in which we dwell. But what about the really crappy stuff ? 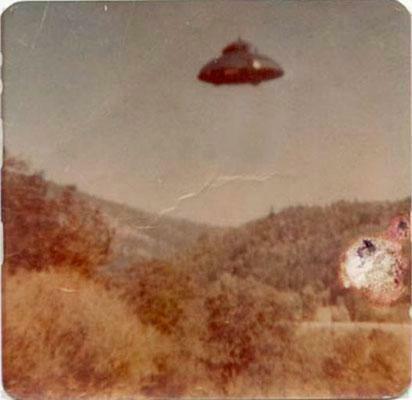 Here I claim that it's that chronic, inescapably dull topic of aliens. Not because they're actually genuinely unbearably boring (though I suppose some of them probably are, I've never met any so I wouldn't know), but because pretty much everything that needed to be said on the topic has already been said, and then said again fifty times. I'll start caring again when we get some more interesting data. 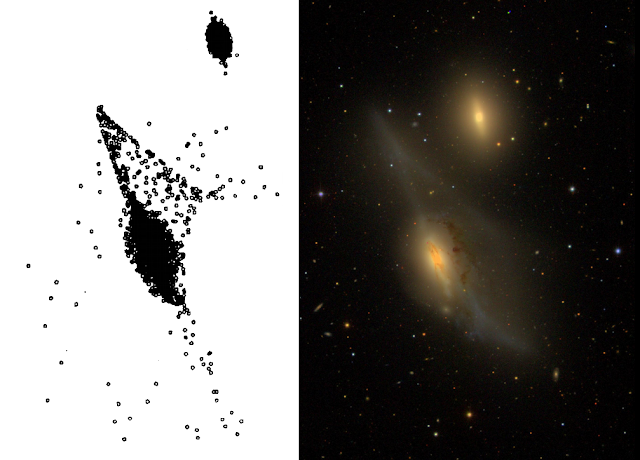 Shorter sequel to the "Flying Snakes" paper once again using simulations to examine if some otherwise pathetic hydrogen clouds in the Virgo cluster could actually be really interesting. The issue : are they just ripped out of normal galaxies as everyone seems to think, or could they be galaxies without any stars ? This time I not only use more advanced simulations, but explain why the debris model just doesn't work and probably never will. Two-part post describing the results of my longest-ever paper. 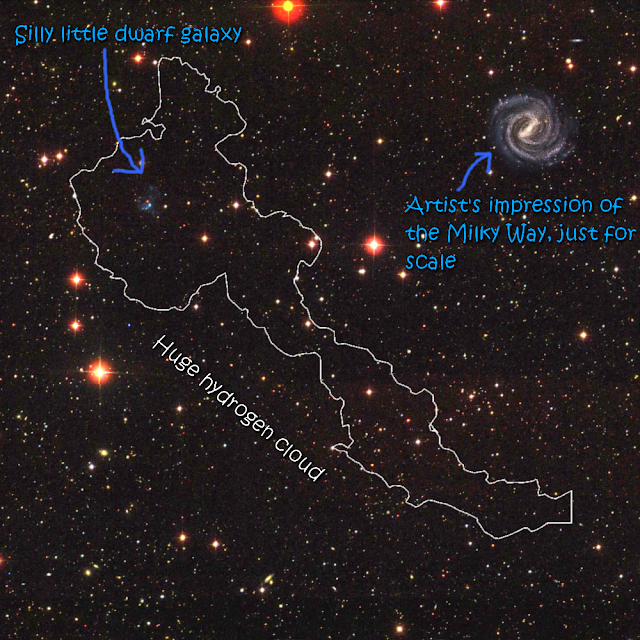 In part one, I describe the observational reasons why some small, pathetic-looking hydrogen clouds in the Virgo cluster might be really important "dark galaxies" without any stars. In part two I describe our numerical simulations which contradict the common explanation that these sorts of objects are just debris and - though it's still very far from certain - are much more likely to be genuine dark galaxies. 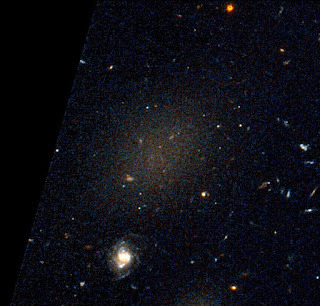 Dark galaxies are currently a hot topic once again in galaxy studies. In some regions thousands of extremely faint, extended galaxies are being discovered which require enormous amounts of dark matter just to survive. This is a very exciting and dynamic time in galaxy evolution research ! But our excitement needs to be tempered. 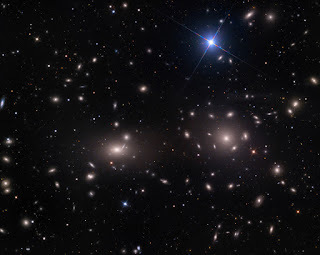 Anyone claiming to have discovered an entirely new class of galaxy ought to take a look at the many previous claims there've been over the years, which I do here. Claims of the existence of another giant planet somewhere in the outskirts of our Solar System have annoyed me. Not so much for the claims themselves, but for the absurdly over-confident statements behind them. Here I describe a historic example where a model seemed to be doing an extremely good job of reproducing the precise details of a complex system... until observations revealed a dramatic new component not predicted by the models at all. Even a model which works is not necessarily correct. Ever wanted to hold dominion over your very own galaxy ? Well ours is at least partially occupied so you'll probably want to start from scratch. Here's how you go about doing that, and why - contrary to some claims - it's damned difficult to do so just using gas and stars. No matter how careful you are, you're gonna need some dark matter too. After five years of observing the nearby galaxy M33 with Arecibo, we discovered a huge ring of hydrogen nearby that previous observations just saw as a small bunch of clouds. What is it ? How did it get there ? Where's Muntab ? These are all questions which we can't answer yet. 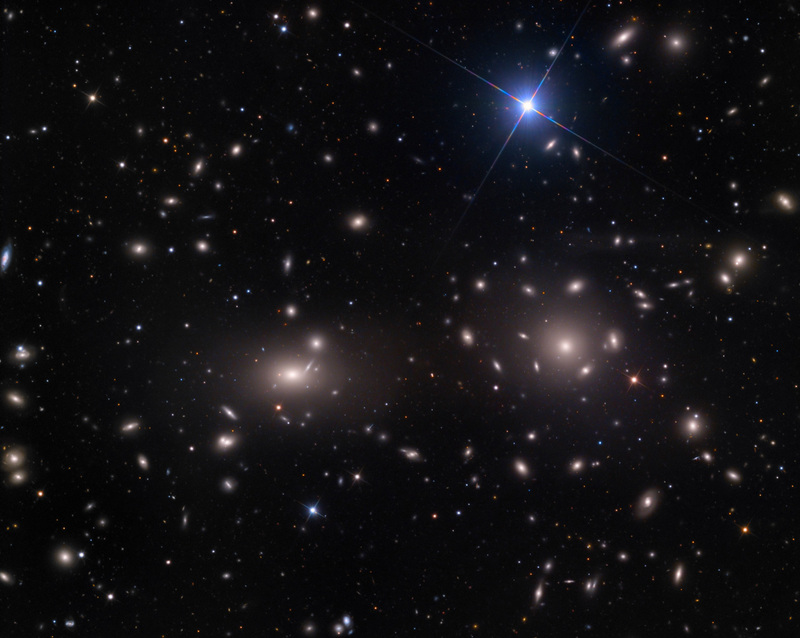 There's been a spate of recent discoveries of galaxies which are large but very faint. They're found in huge numbers - hundreds, perhaps thousands. 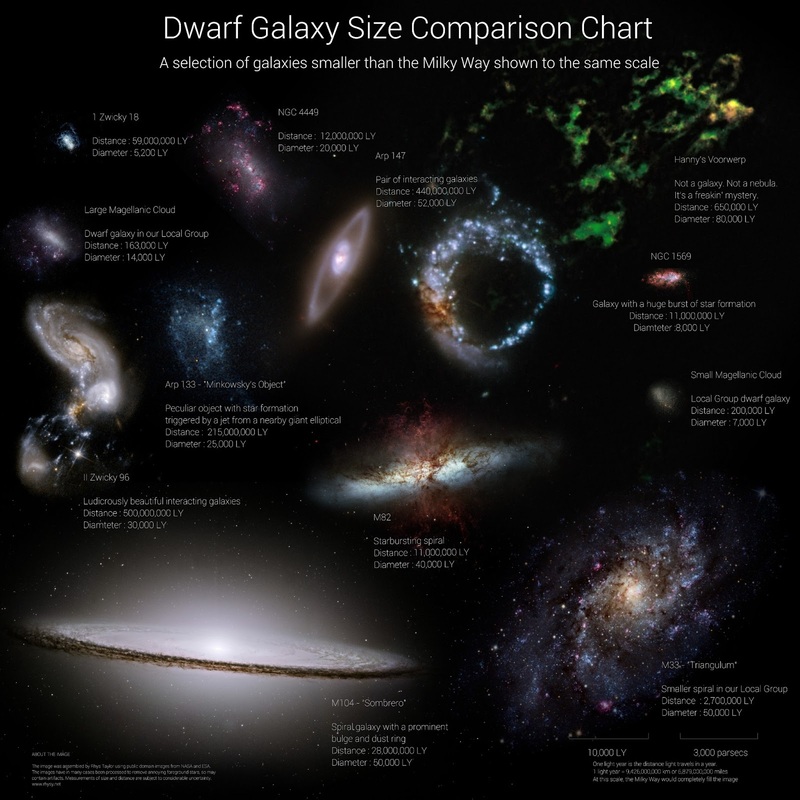 And yet their numbers are still far lower than standard galaxy formation models predict. Have we made a terrible mistake ? It's perfectly possible, but it's far too soon to say for certain. 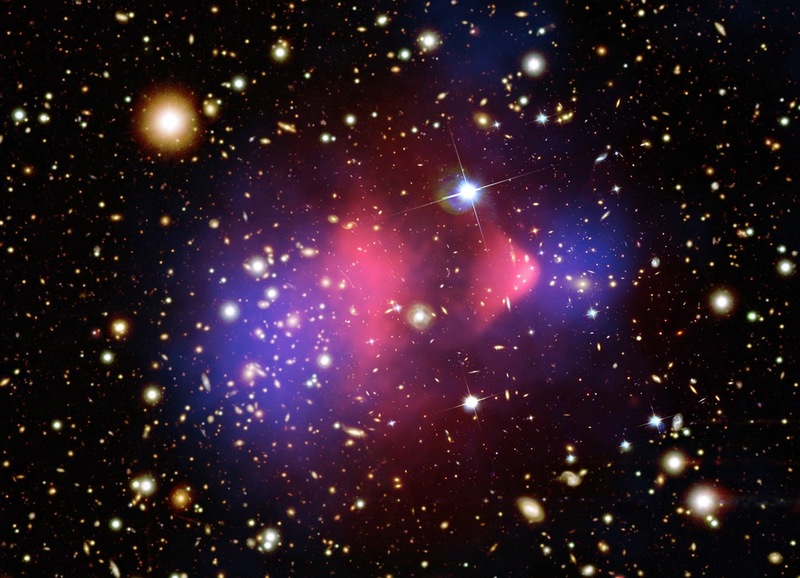 The dark matter paradigm is pretty darn successful, but it's not without some serious problems. 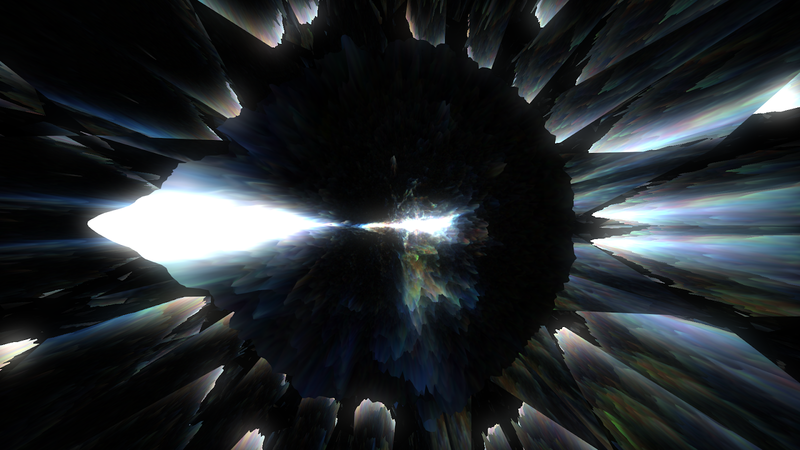 However, the main alternative is modifying gravity, and I'm not convinced that really does a better job just yet. In part 1 I look at why we need dark matter to do more than just make galaxies spin faster than expected. In part 2 I look at the philosophical differences between MOND and dark matter supporters, and find that they're really more similar than either would like. In part 3 I look at the main difficulties for dark matter - they are indeed serious, but not, in my opinion, crippling, and there are possible solutions. 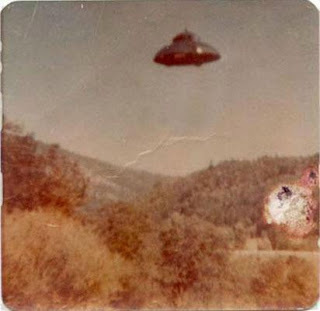 I believe the whole, "is it a planet ?" debate could be easily settled with some common-sense use of the English language. Just call a "planet" anything that's big and round and not a star. Then you have sub-categories of "giant planets" and "dwarf planets", putting everything on equal footing. The current confusing definition of "planet" being explicitly different from "dwarf planet" is therefore avoided. Simple ! There are already some great videos comparing the sizes of other stars, but here I decided to take a slightly different approach and show them in place of our Sun. That's probably the only place familiar enough to show just how gigantic some of these monster are. From the tiny Proxima Centarui to the terrifying UY Scuti - with higher-quality stills of VY Canis Majoris if you keep scrolling down. Confused about why astronomers think most of the Universe is made of something completely unknown ? Think they've gone stark raving mad ? Think again ! Here I look at both the evidence for and against dark matter and its major alternative, modifying gravity. Basically, we're damned if we do and damned if we don't - there is no solution to the missing mass problem that isn't at least a little bit crazy, and dark matter turns out to be the least strange option. ... as I am contractually obliged to point out, because this is my day job. 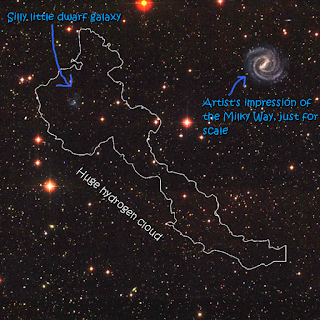 Want to know what the hydrogen in the Milky Way really looks like ? How about in other galaxies ? No ? Well, screw you ! But have a look anyway, because it's really pretty. Can't be having with this "reading" nonsense ? Not a problem. Have a look at this YouTube video instead. Yes it does. It's also full of the darn things, and sometimes they have have the good fortune to come close to Earth and have a silly name. Like 1998 QE2, which I compare to the size of... the QE2 ! And QE2. And the International Space Station. If you've never seen an asteroid transformed into 300,000 cruise ships, you should watch the video. At least it does if you're writing popular science articles for the Internet. Everyone on the Internet loves cats, gifs and size comparison charts. 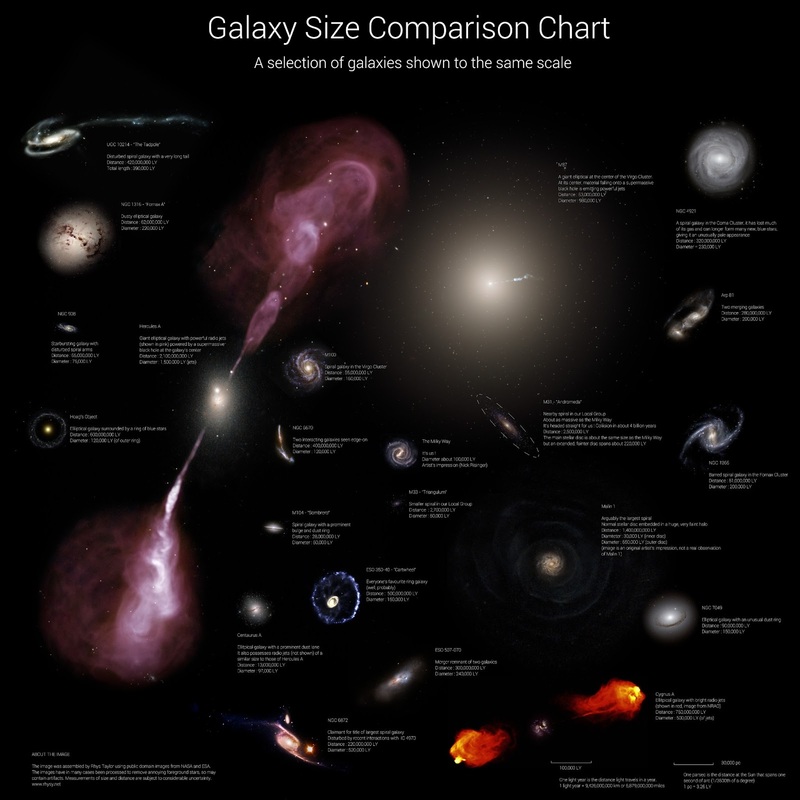 Bizarrely, I found that the only size charts for galaxies were about smartphones. So in a few hours I whipped up some comparisons of giant and dwarf galaxies, and also a short video. The charts can be found in various places online and have also been published in Ciel et Espace, Conozca Más, and most recently Focus Italy. A viral video purports to show the motion of the Solar System through space. And it does, pretty well. Unfortunately this rather well-made video was created by someone with some massive misunderstandings of basic orbital mechanics, and was rubbished by famous "Bad Astronomer" Phil Plait. I decided to examine both Plait's critique and the author's material in some detail - it seems to me that while Plait is entirely correct that the author's science is wrong, the video is not as ridiculous as he implies. Actually it's pretty good. We do move on helical paths through space - a fact which seems to have gotten lost in the pseudoscience. It's a galaxy that looks like the Loch Ness monster, or, possibly, a scorpion. Discovered by a Puerto Rican summer student, this featured in the Scottish Sun, and, to my lasting shame, Fox News. Such is the price to be paid when people actually read your blog. How about 11,710 of them then ? All in their true-ish position in space, with each image corresponding to the actual galaxy at that position. The blog post explains some of the pitfalls of how well we can really map the Universe, while the YouTube video shows a longer version (a better clip is also included in this one). Enough With The Galaxies ! What if you're sick of galaxies and want them to just go away ? Dark matter is supposed to hold them together, right ? So what if you just remove it ? In fact this will only destroy the outer parts of a galaxy, because in the interior dark matter... doesn't matter. Not very much, anyway. I explain more in the blog post, and also have more to say on cosmology here. You can also go straight to the full HD video here. 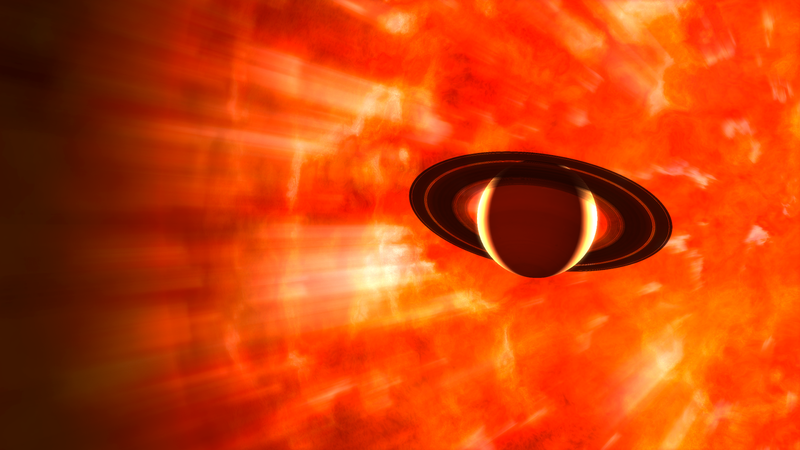 A star so large it would nearly fill the orbit of Saturn. Need I say more ? Hell yes ! Lots more. With lots of pictures of how the Solar System might look if this monster replaced our own Sun. 13,000 hits and counting, thanks to reddit. Replacing our Sun with another star is frivolous and silly. Far more useful to compare the planets of our Solar System with each other by imagining the Earth to be literally a blue marble. I couldn't think of a good reason not to do this. See also, the sequel, Rocky Marbles. For some reason this is insanely popular, having been reshared by Universe Today, io9, the Daily Mail (!) and will also feature on a Yahoo! Spain science channel. 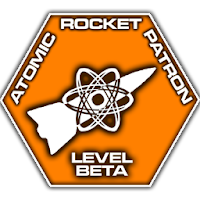 A 4,000 tonne spaceship propelled by atomic bombs to Mars. By far and away my most successful CGI project ever, currently running at over 147,000 hits on YouTube. Unfortunately I didn't have my current website, blog, or YouTube channel at the time, so I don't reap the benefits. Still, images from it appear everywhere, most notably in a Finnish book about Mars. It may even be in English now. One for the hard sci-fi enthusiasts, this was my unfinished attempt to depict a battle between Orion-drive spaceships. Set in a dystopian alternative future where the cold war continues... iiiinnn spppaaaaccce ! I must have been completely mad to think I'd ever finish this. Great post. This article is really very interesting and enjoyable . I think its must be helpful and informative for us. Thanks for sharing your nice post. Thanks for re-organizing all of this!